A new debate, however, has arisen, and to me it is much more interesting than continuing to scavenge among the early constituents of our human rights era. It is a debate — especially if along the lines of my book The Last Utopia you adopt my chronology — that engages the historical relationship between human rights and market fundamentalism. I will have more to say in an essay I am writing now for a new collection of papers in Law and Contemporary Problems. You can read David Grewal and Jed Purdy’sdraft introduction to the collection here. 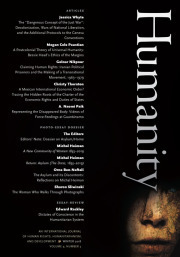 The prospective title of my contribution is “Why Human Rights Are Not Neoliberal (But Haven’t Helped Either).” Also extremely worthwhile is Mary Nolan’s essay “Human Rights and Market Fundamentalism in the Long 1970s,” in a recent German collection, in which she provides a promissory note for her fascinating new research project.